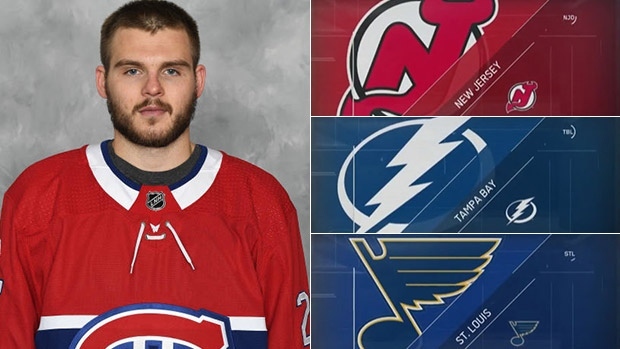 With the National Hockey League’s Feb. 26 trade deadline rapidly approaching, TSN Senior Hockey Reporter Frank Seravalli plays TradeCentre Match Game: Proposing a number of potential team fits for players on the TSN Trade Bait Board. Today, we examine potential new homes for Montreal Canadiens left winger Alex Galchenyuk. New Jersey Devils: Part of what makes Galchenyuk such a fascinating trade chip for Marc Bergevin is that his age and term remaining opens up just about all 30 teams to the possibility. One of those teams interested in a move for now and the long haul is New Jersey. GM Ray Shero loves USA Hockey products like Galchenyuk – the Devils have 13 Americans – and New Jersey could use help on both the left side and at centre. Tampa Bay Lightning: Galchenyuk could go to Tampa Bay and fill the hole left by … Jonathan Drouin. No, seriously. Another trade in the division might make sense. Like St. Louis, Tampa Bay has the centre prospects to make a move like this happen: Brett Howden, Mitchell Stephens and Anthony Cirelli. GM Steve Yzerman has if he’s going to add before the deadline, the goal is to target a player with term. Galchenyuk has three playoff runs before his contract is up. St. Louis Blues: How good would Galchenyuk look on a line with Vladimir Tarasenko? The thinking goes if the Habs are going to move their square peg in a round hole, that Galchenyuk would have to bring back a much-needed centre. Few teams have a better prospect pool at that position than the Blues, with Robert Thomas, Tage Thompson, Jordan Kyrou and Klim Kostin. Thomas may be untouchable, and there’s question as to whether Kyrou is a true centre, but they’re an intriguing potential trade partner if St. Louis is interested in either Galchenyuk or captain Max Pacioretty. Where will Alex Galchenyuk go?